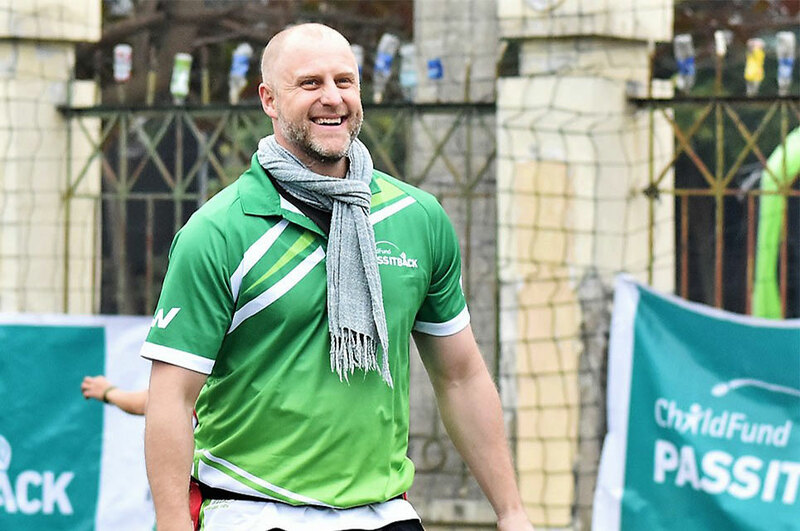 Chris Mastaglio, director of ChildFund Pass It Back, reflects on his early experiences in Laos, and his passion for giving disadvantaged children access to the transformative power of sport. After a train journey from Thailand, and a very long, bumpy and dusty ride on a tuk-tuk to the city centre, I arrived in the country’s capital. After three years in Afghanistan, where my work was focused on improving children’s access to physical education, sport and play opportunities, I decided to head to Laos. Vientiane felt very much like a big country town, and was in stark contrast to so many regional centres in Asia. I love big and chaotic cities, so I wasn’t sure Vientiane and I would be a good match. But it wasn’t long before destiny intervened. The local rugby team needed an extra player and, as I had been off the field for four years because of injury, I was given my first incentive to stay. Thirteen years later and I’m still here, and more involved in rugby than ever. Chris Mastaglio, director of ChildFund Pass It Back, believes that sport for development programs can play an important role in improving the lives of children in developing communities. During my first years in Laos, I worked with a number of international aid organisations, mostly on projects to encourage greater child and youth participation. When ChildFund Australia set up operations, I helped to establish their programs in Nonghet Province, one of the poorest regions of the country and one still impacted by the war in Vietnam, with high levels of unexploded ordnance contamination. I am an individual who is passionate about sport. I love to play, I love to watch, and I understand the positive impact it can have on a young person’s life. I have personally benefited from my involvement in sport over many years. Upholding and safeguarding children’s rights to education, safety and opportunity is the foundation stone of ChildFund’s work. As ChildFund Laos’ country director, I began to think more deeply about the role of sport and play, and its role in international aid programming. To test the effectiveness of sport as a development intervention, ChildFund Laos made the decision to pilot a small Sport for Development project in five villages, using soccer, volleyball, tag rugby and sepak takraw (kick volleyball, which is very popular in south-east Asia). As the project in Laos progressed, it became evident that something interesting was happening around rugby. Unlike the other sports on offer, in rugby the majority of players were female. We realised that as a new and fairly unknown sport in Laos, rugby was not gendered so there were no pre-conceived notions of who should play. Many of the girls involved in the pilot didn’t want to play the other games where boys knew the rules and were seemingly “better” than them. But with rugby, no one knew anything about the sport, so girls could not be “told” how to do it by the boys! Seeing this as a unique opportunity, ChildFund committed to making a more sophisticated program designed to address specific challenges for young people, focusing heavily on addressing gender inequity, while also using tag rugby to teach a range of important life skills. Sport for development is still a fairly new discipline, and its critics will state that as a development program it is not rigorous enough to address the complex challenges that vulnerable children and young people face. As ChildFund, we placed a high value on developing a co-ordinated and scientific approach to measuring change. For ChildFund Pass It Back, we implemented a range of tools to measure outputs, outcomes and impact at coach, player and community levels. An independent evaluation in 2017 found the program itself, as well as its processes, were among some of the best in the world for connecting sport and development outcomes. We are so proud of this achievement. More than five years have passed, and ChildFund Pass It Back has grown way beyond those first five small villages in rural Laos. It has now expanded to Vietnam, the Philippines and Timor-Leste. In 2017, the program won the UNICEF Safeguarding Children in Sport Award at the prestigious Beyond Sport Global Awards. More recently, World Rugby and ChildFund announced they would be partnering for Rugby World Cup 2019 in Japan. This will give more than 20,000 disadvantaged children and youth in Asia the opportunity to benefit from involvement in ChildFund Pass It Back. But most importantly, ChildFund Pass It Back continues to strengthen the resilience of disadvantaged children and youth, equipping young people to overcome challenges, inspire positive social change and “pass it back” to their communities. Previous: Which countries play rugby?